Creating a lot of content to market your business takes time. Luckily, there’s a great shortcut to creating a lot of copy: repurposing blog content into social media posts. With each blog post from your business blog, you can easily create quality social media content in a short amount of time. Simply repurpose your blog content into social media content for your calendar. Did you know that in 2017, 10 percent of marketers were spending 16 to 20 hours a week on social media? And some marketers were spending upwards of 36 to 40 hours a week on social media. That’s a full-time job! As a business owner, we know you simply don’t have that much time to spend on social media. In fact, you might find it hard to carve out an hour. But it’s incredibly important that you carve out a little bit of time to be present on social. You might be tempted to just quit social media altogether. After all, as long as you have a website, you’re doing just fine, right? Although a website is critical for your success, having a blog and a social media presence solidifies your business in the eyes of your audience. The average American spends just over two hours per day on social media and uses three of the eight major social media platforms. A whopping 90% of brands use social media to increase brand awareness. Put simply, if your business isn’t on social media, it’s hard for your audience to say you exist at all. Your social media is a great place to gather leads, improve the customer experience and create lasting relationships with your customers. You already write great content for your blog (if you don’t, you should). Why not use that great content to create even more content quickly for your social media? 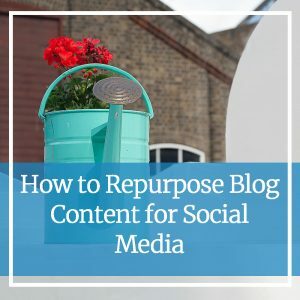 Here are a few unique and easy ways to repurpose your blog content today. Visuals attract attention. When people hear information, they only remember 10% of that information three days later. But, if an image is paired with that info, people retain 65% of it three days later. Take a few quotes out of your recent blog post and create fun social media graphics with them. Your audience has a higher chance of remembering what you said, plus images are highly shareable. Do this for each of your blog posts and you’ll generate several pieces of content all at once. Our favorite free image creation tool? Canva. Check it out! Take a few minutes to go live on your social media channel of choice and discuss some highlights from your blog. Or, answer questions you’ve received in your comments. Scared of going live? Film a quick video instead, edit to your heart’s content, then upload to YouTube, Facebook, Vimeo or wherever else your audience hangs out. Videos have a way of traveling around the internet without much help at all. Plus, 45% of people watch more than an hour of Facebook or YouTube videos each week. There’s no better way to get your audience engaged than through asking questions on social media. Ask your audience a question relevant to your blog post and share it. Not only will you see some engagement, but you might get a few click-throughs to your blog. Did you write a blog that has tips or tricks for your audience? Repurpose each tip into a new social media post. You can also add an image to make an even bigger impact! Lead magnets do so many great things for your business. They generate leads and increase your brand awareness. Take your blog post and format it into a lead magnet that your visitors can download. Then, share it on social media often. If you’re feeling inspired, you can even create a paid ad on Facebook for your lead magnet. There are several great free tools available online that will help you create lead magnets, including Canva and Attract.io. Need Some Blog Content First? We Can Help! Are you stuck without any blog content to get started from? We can help! Our team helps professionals write blog content in their voice. To get started, give us a call at 612-643-1824 or send us a message online!